Vale do Lobo is an exclusive resort along the beach of the Algarve. It features first class golf courses, tennis courts, restaurants and shops. 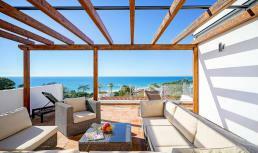 Residence Royale has a wide selection of luxury holiday villas in Vale do Lobo. Rent one of our luxury villas with private pool and have a wonderful holiday in an exclusive environment.